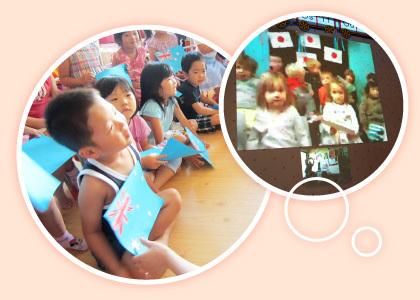 Students spend their whole day immersed in an English-speaking environment. Here at Tree House, we study pronunciation, phonics, vocabulary, grammar, writing (ie. journal), reading, and math. 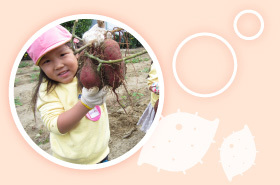 We introduce monthly and seasonal topics with a detailed yearly, monthly, and weekly curriculum. We encourage both individual and group projects for art. Our projects include, but are not limited to, drawing (using crayon, color pencil, water color, engraving), and making collages (three-dimensional projects using boxes, etc.). Occasionally, we make use of the entire classroom to take on large-scale projects over the course of several days such as constructing a zoo, dinosaurs, an aquarium, and even a haunted house. These projects have become an annual tradition enjoyed by parents and students alike. We put significant effort into all of our art projects, as we believe this to be crucial for the development of our students. We believe art is an essential part of the kindergarten curriculum. 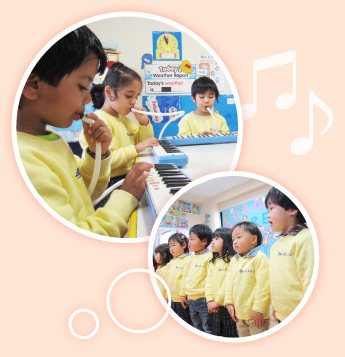 Students begin learning Pianica starting in the first year of kindergarten. We use stickers to mark the keys to teach Do-Re-Mi and practice various songs to learn the basic movement of fingers on the keyboard. Our kindergarten classes not only sing only nursery rhymes, they also enjoy songs from Western artists like the Beatles or Michael Jackson. We even sing English versions of popular Japanese songs like "Do not stand at my grave and weep" to encourage a truly versatile musical vocabulary. We introduce 3 new songs each month for a total of 40 new English songs to learn each academic year! We also put a lot of effort into outdoor activities like Sports Day and various age-appropriate field-trips. We give students the opportunity to climb mountains, hike along rivers, and swim in the ocean. We encourage them to take on challenges and overcome athletically demanding tasks in order to prepare them for Sports Day (one of the biggest events of the year). Through trial and error, we hope to show our students the value of hard work and the satisfaction of finally achieving a difficult goal. We believe that this too is an essential part of the kindergarten curriculum. Another important goal of our school is to provide our students with an opportunity for international exchange. That is why we occasionally write letters, exchange artwork, and study materials with students in schools around the globe in real time via the internet. We believe it is important for the students to practically apply their English to communicate with their peers in other countries. Tree House observes many Japanese cultural traditions and endeavors to teach proper living habits and manners. In addition every afternoon before snack time we observe a 5-minute meditation period for the students to calm their mind and body.